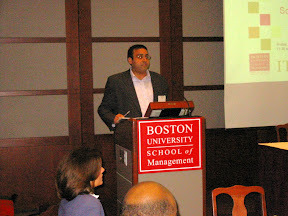 I helped found an annual conference on Social Entrepreneurship in partnership with Boston University called the Forum for Social Entrepreneurship or ForSE for short. Last year was our inaugural conference which was held on November 2nd and attracted over 250 attendees. Here are some photos from the event. Ned Rimer, Co-Founder of Citizen Schools was the opening keynote speaker and drew on his startup experience to speak about the five key steps to taking an idea to fruition. Vikas Goyal, TiE Social Entrepreneurs Group, co-chair and one of the conference co-chairs kicks off the Pitch Panel. Rishi Shukla, CEO of Fitness Forward, a startup social entrepreneur, pitches his idea. Dr. Robert Brown, President, Boston University, in his keynote address highlighted the long and leading role that Boston University and its students have played in nurturing social entrepreneurs in Boston. For example, Goodwill Stores was founded by a BU alumni in the early 1900s. Nishith Acharya, Executive Director, Deshpande Foundation, and main sponsor of ForSE 2007. Alan Khazei, Co-founder and former CEO CityYear, closed the conference with an inspirational speech charging the audience to become citizen advocates and to get involved with the next wave of entrepreneurship. He drew on Mahatma Gandhi’s words to “be the change we wish to see in the world” for inspiration for his new endeavor.